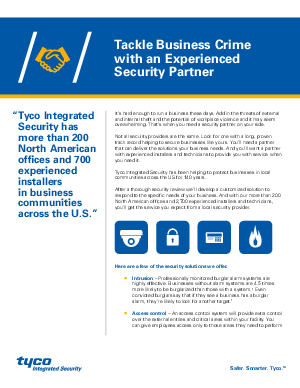 Businesses without alarm systems are more than four times more likely to be burglarized than those with a system. But not all security systems are the same. When you’re looking for a service provider to secure your business, you’ll want a partner that has experienced installers and technicians on staff who can provide you the trusted, thorough service you need. See how you can even use your smartphone or tablet to prevent intrusion, simplify access control, incorporate video surveillance and monitor fire and life-safety systems.